In addition to the Standard version, MadeToPrint InDesign Auto offers hot folder based processing of InDesign files. Running completely unattended as an automated workstation, MadeToPrint can also process XML based information, thus allowing to realize status based output in connection with vjoon K4 Publishing System, WoodWing Enterprise and Van Gennep PlanSystem4. MadeToPrint Auto, available for Mac and Windows, is a plug-in for Adobe InDesign. The Auto function – already part of the Standard version – requires and special license to be activated. You will find more information about configuring MadeToPrint jobs in chapter 2 Setup and run MadeToPrint of this manual. 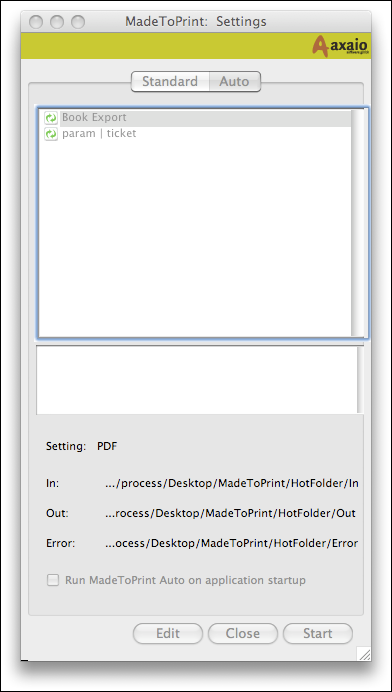 This chapter contains information on how to setup hot folder based automation from within MadeToPrint Auto. Using the MadeToPrint option Start MadeToPrint on application startup in the Run Mode, ensures that MadeToPrint is ready for use right after system restart. MadeToPrint Auto provides exactly the same scope of functionality as the Standard version supplemented by the option of processing documents through hot folders. 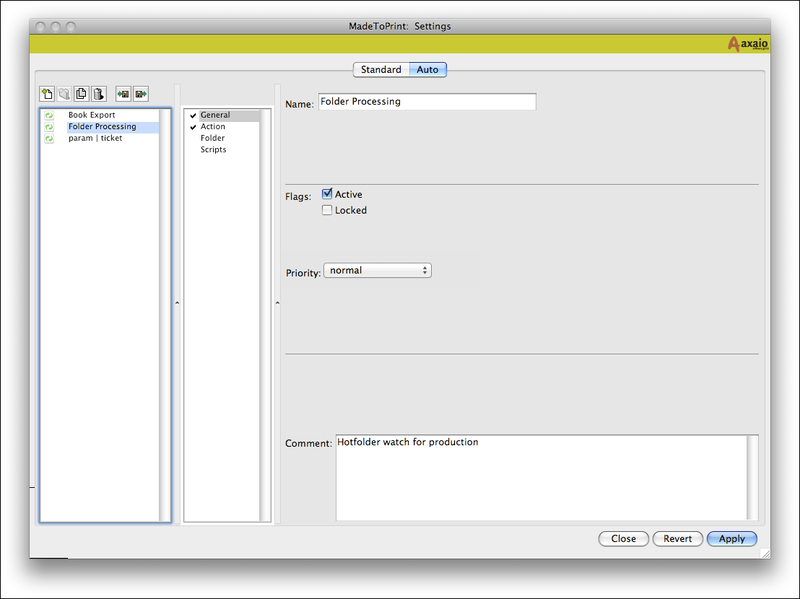 The area Auto in the main dialog of MadeToPrint Auto has been designed to set up queues and to Start hot folder based processing. Specify a name for each Auto job and define whether the job is active and whether the queue is to be monitored automatically after starting MadeToPrint Auto. The Priority popup allows you to define up to five different priorities for the different hot folders. Jobs for archiving can thus be given a lower priority to ensure that more important PDF production jobs are completely finished first before using the processors for less important jobs. With the radio buttons you can determine whether you want to Process documents or whether you want to trigger Jobtickets in the In folder (available only if editorial system is used). If you want to Process documents, all MadeToPrint jobs defined under Standard are available in the popup menu. As option, you can Save changes to modified file by enabling the appropriate checkbox. 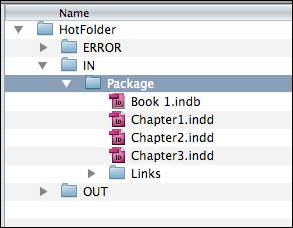 The additional function Process complete folders is meant for processing InDesign packages. In this mode, MadeToPrint can also handle InDesign books. The Packages mode only processes folders in the hot folder. However, InDesign files at the topmost level are not considered. 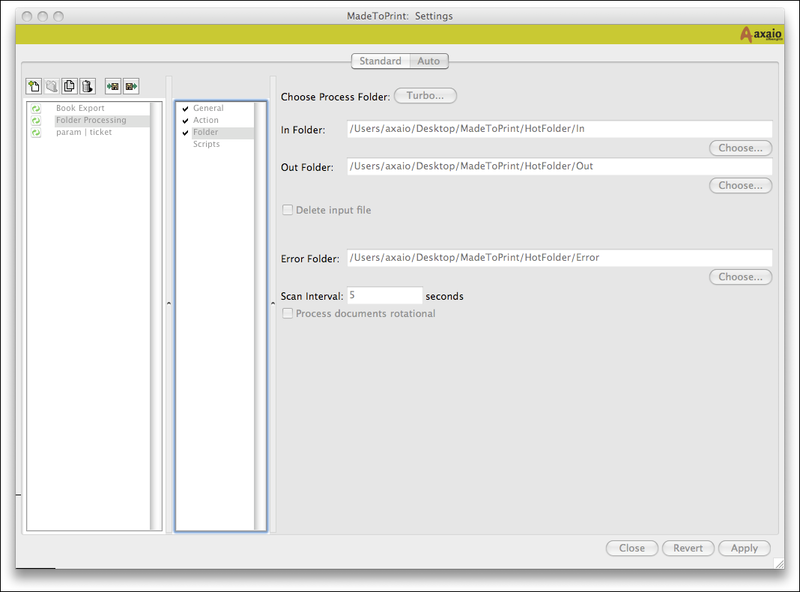 MadeToPrint defines subfolders in the In folder as package. If there is an InDesign file in the first level, it is processed. If there is no InDesign file at this place, the system searches for it in the immediate subfolders. In this area, queues for Auto jobs can be defined. IN (the folder which is monitored constantly for incoming documents), OUT (where documents go which have been processed successfully) and ERROR folder (for documents which could not be output) are necessary to process InDesign or XML documents. The Turbo button will automatically create all necessary hotfolders. The Scan interval determines the time intervals for monitoring the queue. Ticking the checkbox Process documents rotational allows a load-balancing. 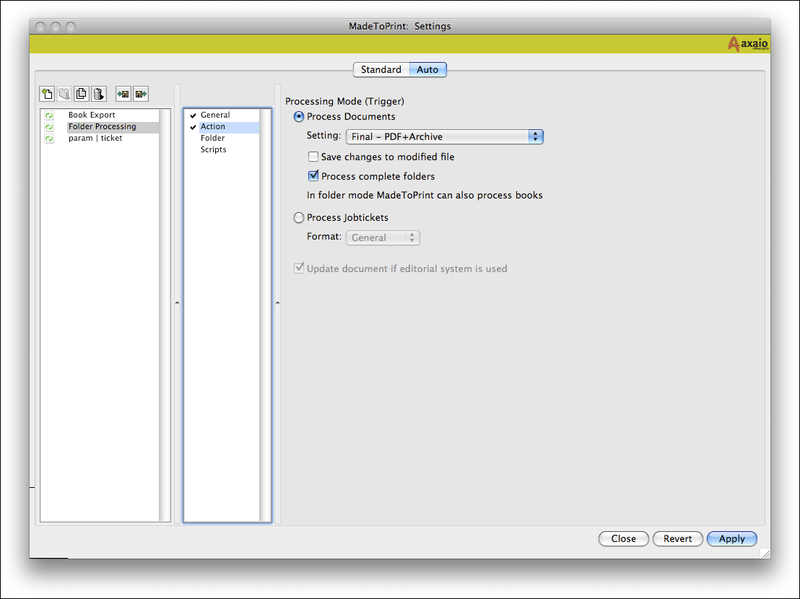 This features requires at least two MadeToPrint Auto plug-ins monitoring the same IN folder. Each Auto job needs separate IN/OUT/ERROR folders, which can be located anywhere within a network. There is no limitation regarding the number of process folders. If you have licensed the Standard version of MadeToPrint InDesign, you can use the Auto version in demo mode. Trigger on documents: Depending on the way you work, it may be sensible to process alias files (Mac), links (Windows) or entire folders (InDesign packages); however, individual InDesign documents can also be placed in the In folder. It is not possible to select the same IN folder for two Auto-jobs. As described on the previous page, each auto job needs separate IN/OUT/ERROR folders. 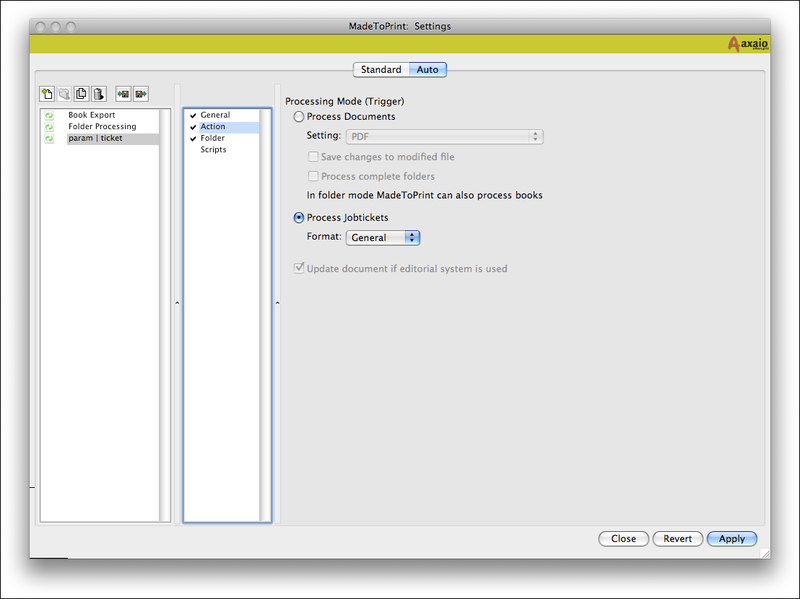 MadeToPrint Auto for publishing systems supports either vjoon K4, Woodwing SCE/Enterprise or Van Gennep PlanSystem4 as InDesign based editorial workflow systems. The integration of MadeToPrint into these systems allows status or task-controlled output, which means that by altering a document status or task, output will be automatically initiated. By using MadeToPrint Auto for publishing systems, users can process jobtickets generated by K4, SCE/Enterprise or PlanSystem4. The format can be selected in the window Edit; Auto; Action under Process Jobtickets. When using MadeToPrint in conjunction with editorial systems, information from within these systems can be used and evaluated through tokens. PLANSYSTEMMETADATA and JOBTICKETMETADATA as tokens, information like on publication, issue or editor can be picked up by MadeToPrint and be used for naming output files.